Marvel Television and Netflix announced that award-winning actor Vincent D'Onofrio (The Magnificent Seven, Jurassic World) will return to the highly-anticipated and critically-acclaimed Netflix original series Daredevil, reprising his role as Wilson Fisk, the powerful businessman whose interests in the future of Hell's Kitchen brings him into conflict with the blind attorney Matt Murdock and his alter ego Daredevil. All episodes of the first and second seasons of Marvel's Daredevil are currently streaming on Netflix, with season three slated for release in 2018. 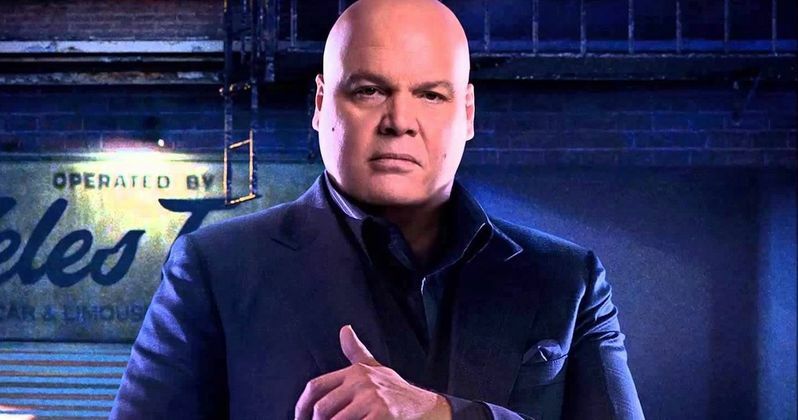 D'Onofrio is joined by returning cast including, Charlie Cox (Matt Murdock/Daredevil), Deborah Ann Woll (Karen Page), and Elden Henson (Foggy Nelson). Additionally, Erik Oleson has joined Daredevl Season 3 as showrunner and executive producer. Oleson was most recently head writer and Executive Producer of Amazon's The Man In The High Castle. Here's what executive producer Jeph Loeb had to say in a brief statement about the return of Kingpin. "Vincent is an exceptional actor who returns with the incredible gravitas he brings to Fisk. We're very excited how Marvel's Daredevil develops through the creative lens and guidance of our new showrunner, Erik Oleson." D'Onofrio starred as Detective Robert Goren in over 100 episodes of the series Law & Order: Criminal Intent. He received an Emmy Award nomination in 1998 for his riveting guest appearance in the Homicide: Life on the Street episode The Subway. D'Onofrio also directed, produced and starred in the short film, Five Minutes, Mr. Welles, and recently appeared in the Academy Award-winning short The New Tenants. He is represented by Silver Lining Entertainment and United Talent Agency. A report from August claimed that Daredevil Season 3 starts production on October 15, but that was never confirmed by Marvel. Marvel's Daredevil follows the journey of Matt Murdock, who was blinded as a young boy but imbued with extraordinary senses, now fighting against injustice by day as a lawyer, and by night as the super hero Daredevil in modern day Hell's Kitchen, New York City. The third season of Marvel's Daredevil is Executive Produced by series Showrunner Erik Oleson (Man In The High Castle and Drew Goddard (Cabin in the Woods), along with Jeph Loeb (Marvel's Jessica Jones, Marvel's Luke Cage) and Jim Chory (Marvel's Jessica Jones, Marvel's Luke Cage).